Francis Deron, "The Cemeteries of Maoism"
For all that, there is at least one domain in which one desires that the quantitative prevail: the still hardly explored field of State crimes, which greatly interests the Chinese world and thus Monde chinois. One precisely desires that a response is made to a forty-year-old question concerning the balance sheet – measured in human lives – of the “cultural revolution,” which was one of the very worst monstrosities of the Twentieth Century. In an interesting way, the “cultural revolution” is the only political cataclysm of the post-1945 period in which conjecture and extrapolation are still the rule and the researcher is condemned to case-by-case observations, which reveal that, more or less, the torment didn’t spare anyone. But this doesn’t answer the question. We are reminded of a play reviewed in the 1990s by a press organ of the Chinese regime called The Daily Newspaper of Justice. In a very factual fashion, this daily recounted the appearance before a criminal court of a poor peasant (let’s call him Li), convicted of murdering his own daughter, who was of nubile age. It so happened that a peasant from the neighboring village (let’s call him Wang), who was considerably less poor than Li, had made it known that he wouldn’t tolerate the chagrin of seeing his son, who died from some illness, remain unmarried, and that he was ready to furnish comfortable compensation to the family of any prematurely deceased young woman who would agree to go along with a simulated union of the defunct young couple. This “marriage in death” was a formerly widespread practice in Chinese campaigns that intended to spare young people the fate of being “wandering souls” in the beyond. Heavily in debt, the peasant Li didn’t hesitate: he wrung the neck of his only daughter and one fine morning presented himself to the peasant Wang to claim his “bonus” for the cadaver. This atrocious story, far from a unique case, revealed an erosion of elementary moral values in a society profoundly brutalized by the Communist regime. The violence during the “cultural revolution,” the subsequent abandonment of the meager moral security net constituted by “Communist values,” and the vertigo caused by the return of monetary values as the sole social reference point probably explain the act of the murderous father. Though this doesn’t excuse his crime, we ask the following about the peasant named Li. Did he not belong to the immense troop (that is to say, to the still uncounted numbers) of the direct and then indirect victims of Maoism under its most supped-up form, those who suffered the full force of the acceleration of totalitarian horror that started in 1966? Should we be surprised that some people, after seeing the elementary moral cursors pushed in every direction, had difficulty readapting upon their return to less demented zones? Individual testimonies published in China or available in the West concerning what took place during the years 1966-1969 aren’t lacking. Neither are narratives concerning [the events in] specific localities. Individual or collective psychological difficulties have been discussed in a substantial manner, if not systematically explored, by many authors, either in literary form (and with prudence) or through participation in university, statistical, etc. studies. Nevertheless, a number, a simple numerical report, incontestable and thus not marginal, is lacking. How many deaths were there throughout the country during the “cultural revolution”? Song Yongyi, an academic living in the United States, has advanced the number “three million, or 0.5 percent of the Chinese population [at the time].” His study, first published in Hong Kong and soon to appear in France, couldn’t go any further without falling into the trap of extrapolating from specific cases. Because what is the most striking thing in the black hole of the years 1966-1969 in China, four decades after the fact, is its nebulous character, the way it exceeds its totally unexplored perimeters, and this in an age in which every single centimeter of the earth has been passed through the fine comb of historical knowledge, in which spatial technologies allow researchers to reconstitute the everyday life of a city buried in the sand for millennia. “For the moment, it remains difficult to go much further than what this book proposes, that is to say, a specific, general idea of the murderous madness,” Marie Holzman emphasizes in her introduction. This collective volume was put together by eight writers and researchers, half of whom live in the United States and among whom figures Zheng Yi, who had already published the results of an overwhelming inquiry into the resurgence of cannibalism in Guangxi Province, where the “cultural revolution” was particularly deadly, as testified to by two texts in this volume. “It would be cavalier,” Holzman notes, “to generalize from examples given in the narratives” concerning eight precise cases, quite circumscribed in time or space, or both. Before qualifying these remarks, we must first agree on what we mean when we talk about the “cultural revolution.” In particular, it is indispensible to provide a precise historical delineation dictated by the reality of the facts of the period. The wuchanjieji wenhua dageming began in 1966 and was essentially over by 1969, if one only considers the period of absolute social chaos, which was its most visible character. What followed the 19th Congress of the Chinese Communist Party in 1969 more resembles a very serious period of social instability, fed by and in turn feeding the crises at the summit of the political hierarchy, but no longer totally escaping from the control of the Communist forces of order, except in the most remote regions. The fact that, soon after the death of Mao, the regime demonstrated the need to designate the ten-year-long period from 1966 to the internal putsch against the radical wing of Jiang Qing in October 1976 as the “cultural revolution” is only a historiographical subterfuge designed to reconstitute a certain legitimacy for itself in the face of the ocean of incomprehension concerning the place of the “cultural revolution.” In the last phase of Mao’s life, this ocean inundated the country. On this account, it would be a falsification to claim that “normality” returned to the top on the day of the return to grace of Deng Xiaoping in the summer of 1977, even if calm prevailed in the streets of the large cities. This process had begun before Mao’s death and went on for several years afterwards. An example, among a thousand others: the repeated orders by the authorities – made in several provinces, in particular, in the south (Guangzhou), between 1978 and 1979 – that civilians should [locate and] take back the weapons that were stolen by the army during the “hot” years and kept since then in hideouts with the idea that they might possibly be used some day. These appeals came with a sufficient frequency to suggest that they were rarely successful. Today one still has the right to wonder about the exact extent of these shadow arsenals that the police never managed to lay their hands on. This established, we must obviously declare that the mathematical extrapolation from a [single] district, village, street or entire province – in a country as vast and diverse as China – is indeed impossible and insults both the victims and the survivors. All casualness is prohibited in this matter. But the experience nevertheless dictates comparisons or at least instructive connections. Demographers, whose science is far from being exact, furnish methods of assessment that “massacrology” would (alas!) be poorly inspired to make use of, if – as we think – a serious effort remains necessary to comprehend the profound gearwheels of Chinese society today on the basis of the traumas of the late 1960s. As is shown in many other cases, it is true that one doesn’t erase an unfortunate past by simple hyperbolic economic growth, as Peking and the entirety of the planet’s financial decision-makers tried to make it believed in the case of China. First connection. Between 1975 and 1979, in a little more than three years (a period comparable in duration to the “great chaos” in China), and barely ten years after the start of the “cultural revolution,” the Khmers Rouges (the sorcerer’s apprentices to Chinese-style revolution) inflicted on miniscule Cambodia – then populated by eight million inhabitants, which made it slightly smaller than Peking at the time, hardly larger than Canton and its surroundings – an immediate loss of not less than a third of the [entire] population through two essential means: pure and simple State violence in the context of generalized slavery, and famine. Second connection, a direct contemporary of the “cultural revolution.” Between 1965 and 1967, the Indonesian General Suharto supervised, at the national scale, the physical elimination of between 500,000 and one million Leftist sympathizers and other civilians suspected of subversive tendencies across his country’s archipelagoes (with the patent acquiescence of Washington) in the name of absolute national unity against Communism. It was the deadliest repression of civilians by an Asian power outside the Communist world in the second half of the 20th century. In both cases, one must emphasize that the means used by the State in its base works were quite weak compared to those used during the “cultural revolution” by the diverse armed forces in China. In Cambodia, the Khmers Rouges abolished the mechanization of horror. The majority of the victims put to death in extrajudicial proceedings were assassinated by so-called cold weapons, with the bludgeon striking the skull of the torture victim, bound to his knees, being the most frequently used method, as attested to by the 2,000-plus collective graves found all over the country since then. Other rudimentary instruments were used, but they also indicate a return to the rural universe that characterized the regime of Pol Pot. One also saw the regular utilization of palm-tree branches with finely serrated edges that, when handled well, can have the same effect on a human throat as the sharpest saber blade. There is no reason to think than a significant number of firearms were used to eradicate the “internal enemy.” The Khmers Rouges combatants or their civilian auxiliaries – often fanaticized children whom the adults had thrown to the lions – had too few guns or were too thrifty with their munitions, so these “cold” means of putting people to death were more than exceptional. In the case of Indonesia, the means were more plentiful, but the nature of the violence perpetrated by the State’s representatives hardly implied recourse to the summits of sophistication. The Indonesian Army and its mercenaries were devoted to what was essentially a manhunt that ended with gunshots. The greatest difficulty that they encountered involved the terrain of the pursuit: very dense forests, the necessary deployment across hundreds of islands in an era in which logistics (fuel, mechanical parts) still fell far short of geographical needs. . . . These obstacles were surmounted by a strong determination to “break Communism” on the part of the agents of the “New Order” then being implanted. Another instructive connection is furnished by Suharto’s Indonesia. When the old Portuguese colony of East Timor declared its independence following the withdrawal of the Lisbon administration (a consequence of the overthrow of the Salazar dictatorship in 1975), the almost immediate invasion of forces from Jakarta very rapidly (in only two or three years) ended in the physical elimination of a third of the total population, then estimated to be 600,000 inhabitants. This on a territory as large as a district in China, and populated in the density one finds in the most remote desert regions of that country (half the population of Timor was concentrated in the capital city, Dili). These comparisons are limited to the crises of the same era as those of the “cultural revolution,” [which came] after the great bloodletting of the Second World War in Asia and outside of the field of generalized famine that followed, in China, the “Great Leap Forward” of 1958. They permit one to advance the idea that the number of three million victims cited by Song Yongyi for the period 1966-1969 constitutes a minimum that is surely too low. For several reasons: the territorial continuity of China; the free disposition of the weapons that the Red Guards rapidly obtained by seizing them from the barracks’ arsenals in the name of Mao; the ability to borrow means of transportation (not immobilized by the chaos, but placed at the disposition of the “rebels”); the quasi-unlimited use of cruel treatment inflicted on prisoners in the absence of any codifications; the exemplarity conferred on the violent public humiliation of selected victims. . . . So many factors that only favored the generalization of violence, whether it was committed by the State or what remained of it by those who identified with the State on their own authority, or by spontaneously formed groups whose ideological motivations were more and more confused. In many cases, it is effectively impossible to project to the national scale and stay within a logical schema, but one can still demonstrate the extent to which the tendency to “excess” was able to go. In addition, the work by Song Yongyi confirms that the violence wasn’t at all the work of a particular social category (that of the “rebels”), as the Chinese government hasn’t ceased to claim since these events took place. On the contrary, the violence was shared by all segments of the army and the [civilian] population mentioned above: from Communist cadres to outspoken little hoodlums, everyone had recourse to it. Likewise, the victims in the case studies were “recruited” from every social level: no group, whether it was or was not featured in the little papers of institutional Communist ideology, was spared. Half a million to one million PKI sympathizers in Indonesia (the largest Community Party in the world to never take power); 1.7 to 2 million deaths in Cambodia; 200,000 deaths in tiny East Timor . . . to only speak of the countries near China, setting aside all the delicate connections with crimes of the same order in Africa and Latin America. So many numbers that allow one to estimate that there were more than three million direct victims of the “cultural revolution” in China. Nevertheless, the prudent approach of Song Yongyi can be explained by a general context of intimidation that has blocked all attempts to know more about what really happened. The post-crisis context is different in the three other cases. In Cambodia, the Khmero-Vietnamese war (1978-1979), the rout of Pol Pot’s regime, a feeling of guilt in the United States after the war, and the presence on American soil of a large proportion of the exiled Khmer population have [all] served as stimuli to conducting research, which has furnished more information about the brief passage of the Khmers Rouges into [and out of] power than what is known today about a single province in China during the “cultural revolution.” A program at Yale University, which involves trips to Cambodia, has permitted researchers to bring to light and inventory tens of thousands of archival pages that will serve as the basis for further research and [legal proceedings] at the Special Khmers Rouges Court (established in Phnom Penh with the support of the United Nations) to judge the leaders who are still alive. In Indonesia, the misfortunes of the Communist movement have received resounded echoes – natural, but beneficial – in the Netherlands, and belatedly but relatively so, in American universities. Research in [East] Timor, Australia and Europe have also fed an international indignation that has ended up at the United Nations, where the Timorese cause was substantive in the 1980s. Concerning China, Western universities as a whole (with rare exceptions) have complied with the Pekinese ukase that prohibits any inquiry into the “cultural revolution” in its national dimensions. Western researchers have been content to imitate their Chinese colleagues in their limited approach in space and time, taking refuge behind the argument that only access to the secret archives of the Communist Party would permit a national approach. And the Communist Party, for its part, has tried energetically to dissuade any hint of work in this direction by incarcerating the several Chinese historians who risked doing so in 1987-1988. Song Yongyi himself spent a little more than six months in a Chinese prison (1999-2000). The State secrets concerning the immediate human cost of triumphant ultra-Maoism remain inviolate. The refusal of the Chinese government to open its most scandalous archives on the horrors that it has, in principle, repudiated is, in itself, a measure of the fragility of all its abjurations of those events. The absence of external pressure upon Peking emphasizes a contrario the docility of the western research community with respect to the decision-making community in the self-same “democratic” West. Who seeks to see the recollection – at a meeting at Zhongnanhai – of the number of cadavers that have reposed in the heavy chairs of the reception room there? The historical reality thus remains padlocked in a safe that preserves convenient illusions. Notably the one that claims Communist China ceased exporting its internal torments when the great pandemonium of the combat of 1966-1969 calmed down some. If this safe were opened up, one would quickly learn that it wasn’t Mao and his henchmen, nor even fleeting Hua Guofeng, who were the best supports for the Khmers Rouges in Cambodia, but people like Zhou Enlai and Deng Xiaoping: the clan that would go on to build the post-Mao era and China’s reconciliation with the West. It was Deng who furnished Pol Pot the weapons that the latter used against Vietnam, to the great satisfaction of Henry Kissinger (who congratulated himself, in these terms, concerning the Thai Generals Kriansak Chomanan and Chavalit Yongchaiyudh, at the end of 1975, even before Deng’s return to power). And it was under Deng that the Khmers Rouges, after their defeat in 1979, managed to make very good friends in Washington, at the United Nations, and in Paris, in the name of Cambodia’s “national sovereignty,” which the Khmers Rouges supposedly still represented after losing power. Thus, by showing such deference to the ambient goodthink [le bien-penser ambient] – the very same one that makes it react, as a whole, with the vehemence that one saw concerning the publication of Jung Chang and Jon Halliday’s book on Mao – the world of research has devoted itself to an approach that is a little subtler than is customary. We remember another polemic, entirely French: the polemic that greeted the publication in 1997 of Le livre noir du communisme, a work whose introduction created a scandal by placing side-by-side the balance sheets in human lives of the Nazi genocide of the Jews and the Stalinist repression [of his own people]. At least three of the authors renounced the book, judging “the connection” to be inopportune. This polemic also concerned variations in the numbers, the total for [all of] Communism, the order of a few percentage points. . . . And yet that 840-page-long book only included a small amount of information about Asiatic Communism, China itself being poorly represented in it, despite the large number of people involved in this history and the large number of deaths recorded under the Red Flag. This obviously isn’t a matter of records or files, even if there’s a kilo of paper for every ton of cadavers. Only eloquent connections, even if they are improper. We maintain here that, if one doesn’t have an approximate idea of the sum, in numbers of victims, with respect to the entirety of the country, it remains impossible to take the full measure of such an ordeal and its distant consequences. It suffices to recall, through another improper connection, that the First World War made France lose seven percent of its total population and the Second World War five percent. We know the long-term consequences of both. As recently as yesterday, the historical revisionists discounted the shinbones found in Pol Pot’s mass graves in an attempt to show that there was no genocide in Cambodia. Since the 1970s, macabre discoveries (a staggering number of them for such a small nation) made in the paddy fields by the tips of ploughshares have shut that argument down. And yet, for all that, the ultimate responsibility for these crimes – the determinant support furnished by China to Pol “Goes to War” Pot, with nothing but contempt for geopolitical reality – risks remaining forever in limbo, unjudged, unpunished. The international trial in Phnom Penh of the surviving leaders of the Khmers Rouges, which has the distinction of being the first Communist system to face international justice, was cut back to avoid causing troubles for the countries that more or less permitted the Khmer tyrants to give a complete accounting of their means and then forget about them. The Chinese embassy in Cambodia, which has a long history as a very special bastion for Peking in Indo-China, is still on its guard to make sure there is no bending of this rule. Thus the Special Khmers Rouges Tribunal will exonerate from all examination – not just Peking – but also France, Great Britain and the United States, which allowed Pol Pot to pass for an honorable person on the world stage and, twenty years later, allowed the assassins who were his henchmen to speak of their own victims at the tribune of the United Nations. Concerning the internal torments of China, those who forget the phrase “cultural revolution” still look elsewhere for answers. An era that quantifies more than is reasonable, without seeking to fill in such a hole in its knowledge of its own recent past, seems unaware that forgetting State crime always ends up joining the crime itself. All things considered, if there is a domain that one desires to see conquered by the dictatorship of numbers, it is the cemeteries of Maoism. From 28 September to 22 October 1977, the leader of the Khmers Rouges, Pol Pot (on the right), made what would be his only official visit to other countries (China and North Korea) as the leader of the “Democratic Kampuchea” regime installed by force in Cambodia on 17 April 1975, in the aftermath of the American defeat. It was the first time that Saloth Sar, the clandestine ringleader of the Cambodian Communist insurrection since the 1960s, showed his face to the international public. Since then he had become “Pol Pot” and undertook in his country the most radical (and ultimate) “Communist revolution” in the world. Balance sheet after three-and-a-half years in power: at least 1.7 million dead. Reticent concerning the expeditious methods of the Khmers Rouges (openly inspired by Maoism), China nevertheless gave its full and complete support to “Democratic Kampuchea” in its war with Vietnam, which ended with the victory of the latter. 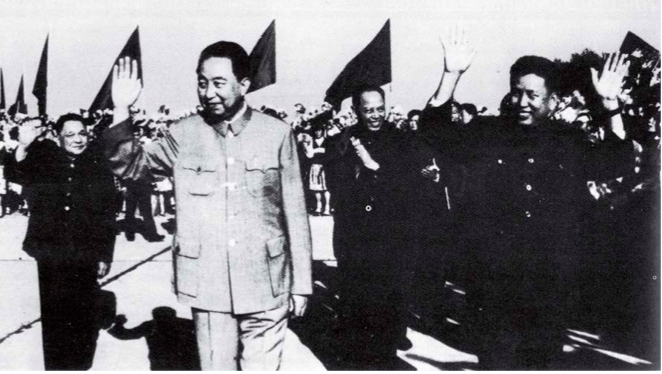 This official Chinese photograph (probably from Xinhua) was greatly used by Vietnamese propaganda to demonstrate the collusion between the Khmers Rouges and Peking with a caption that specified that Deng Xiaoping (on the left) and Hua Guofeng (in the foreground) had made a triumph of Pol Pot’s “arrival at the Peking airport on 28 September 1977.” In fact, Deng – who would be restored to his functions at the heart of the Chinese high command after having been dismissed by Mao, and thus "dead" – was absent the day of the welcoming ceremony for the leader of the Khmers Rouges (testimony of the author, corroborated by his current colleagues). This photographic negative can, in fact, only show the farewell ceremony for Pol Pot, at the same airport, on 22 October 1977, after discussions in which Deng tried in vain to convince the Khmers Rouges to play for time with Vietnam, while Pol Pot successfully applied himself to throwing oil on the fire of the already strained relations between Peking and Hanoi. Thus this is the very last photo of Pol Pot as the officially recognized leader of the government (chased from Phnom Penh on 7 January 1979, he would die in the jungle in 1998). At the second rank, between Hua and Pol Pot, was Ieng Sary, Vice-Prime Minister in charge of the foreign affairs of “Democratic Kampuchea” and brother-in-law of the leader of the Khmers Rouges. Ieng Sary, in 2008 en route to be judged in Phnom Penh by the court for international justice for “crimes against humanity,” was the kingpin through whom came the official and secret communications between Peking and the Khmers Rouges before, during and after their passage to power and, consequently, all the diplomatic, political and military assistance from the People’s Republic of China for the extermination of a fourth or a third of the entire Cambodian population. 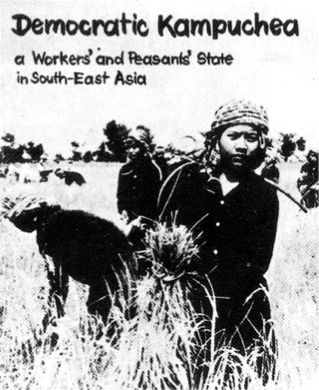 Brochure printed [in English] in the People’s Republic of China, probably end of 1975 or beginning of 1976, glorifying the accomplishments of the Khmers Rouges in Cambodia. Document found in Cambodia. 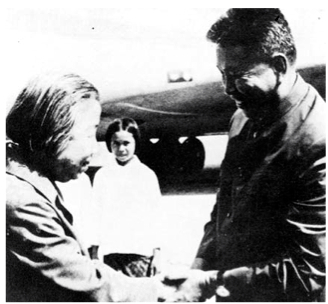 On 18 January 1978, Pol Pot welcomed Deng Yingchao, Vice-President of the Chinese National Assembly and widow of Zhou Enlai, to Phnom Penh for a high-profile diplomatic visit by which Peking tried to show its support for “Democratic Kampuchea.” The Vietnamese Army inflicted a first correction to the army of the Khmers Rouges on the border [between the two countries] in answer to the Cambodian raids against the villages in the south of reunified Vietnam. Photo probably from Xinhua. During his visit to China, Pol Pot (on the left) received the support of Deng Xiaoping for the “successes” of “Democratic Kampuchea” in the constitution of a “classless” society and [in the battle] against Vietnam. Official undated Chinese photograph; probably from Xinhua. 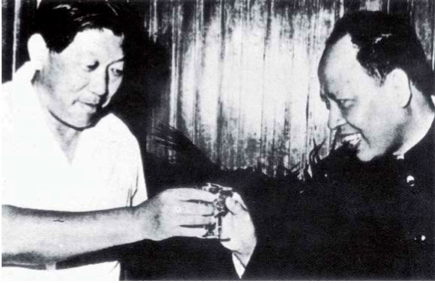 The ambassador from the People’s Republic of China to Cambodia, Sun Hua (on the left), makes a toast with Ieng Sary, brother-in-law of Pol Pot and head of foreign affairs for “Democratic Kampuchea.” Photo found by the Vietnamese Army in the archives abandoned by the leaders of the Khmers Rouges in Phnom Penh in January 1979. The real, official Chinese passport for Ieng Sary, the head of “diplomacy” for the Khmers Rouges, under the false Chinese name “Su Hao,” supposedly born in Peking on 1 January 1930 (he was actually born in South Vietnam), issued by the Chinese Minister for Foreign Affairs, to allow Sary to travel outside of China after the fall of the Khmer Rouges regime to the Vietnamese Army. Origin of photo unknown. The French word employed here, curseurs, means “pointers,” but it also concerns methods of calculation. Les massacres de la Révolution culturelle, texts collected by Song Yongyi. Translated from the Chinese into French by Marc Raimbourg, with a preface by Marie Holzman (Buchet-Chastel, 2008). Translated into English, apparently updated and available on-line as Chronology of Mass Killings during the Chinese Cultural Revolution (1966-1976). The central headquarters of both the Chinese Communist Party and the State Council of the People’s Republic of China. Jung Chang and Jon Halliday, Mao, the Unknown Story (Jonathan Cope, 2005), translated into French by Georges Liébert, Mao, L’histoire inconnue (Gallimard, 2006). Le livre noir du communisme. Crimes, terreur, repression, edited by Stéphane Courtois (Robert Laffont, 1997). The French here is des négationnistes. The “logic” here is that the loss of a shinbone, or even two shinbones, is not necessarily fatal. Let us dwell for several moments on this murder, which was so exemplary of the millions that followed. The torture lasted a full day: turds forced into her mouth, beaten on her entire body with studded planks. It was 5 August 1966. Thirteen days later, Song BinBin, one of the little killers, selected from among the others, mystically raised the armband of the Red Guards higher than the elbow, which was where President Mao wore his. It was Mao himself who suggested to him that he change his name from BinBin (“gentle and modest”) to Yao Wu (“goes to war”).